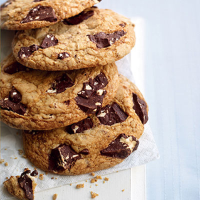 Sometimes we shouldn’t have to choose between a biscuit and a chocolate bar – this recipe allows you to have your outsize, gooey cookie and eat it. Preheat the oven to 180°C/gas 4 and line two large baking sheets with non-stick baking parchment. Cream the butter with the sugar until light and fluffy. Beat in the egg and vanilla extract until the mixture is smooth, then stir in the flour, bicarbonate of soda, salt and 150g Toblerone. Drop 3 generously heaped tablespoons of dough onto each prepared baking sheet, leaving at least 7cm space between each to allow for spreading. Sprinkle the remaining chopped Toblerone over the surface of the cookies. Bake for 15–17 minutes, until dry-looking and covered with even cracks but not quite firm to the touch. Leave to cool and firm up on the baking sheets for a few minutes before carefully peeling away from the paper. The cookies will keep in an airtight tin for up to 3 days. A gentle, American-style coffee served in generous portions may assuage the guilt.